You could be going for a spin in anti-gravity by 2018. While SpaceX just successfully launched a reused rocket for the first time Thursday, Blue Origin has done it before. Jeff Bezos’ private space company has reused one of its rockets twice, in fact. Just this week, the West Texas-based space tourism company gave a preview of its reusable space capsule. 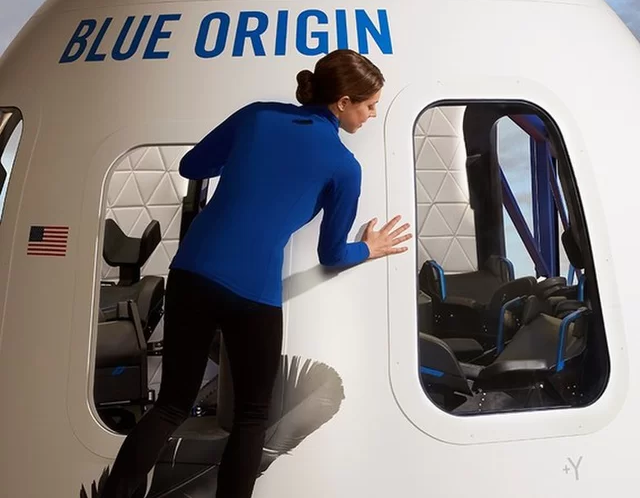 The New Shepard passenger capsule and rocket, according to Blue Origin, will be the company’s tour bus for brief trips into space. 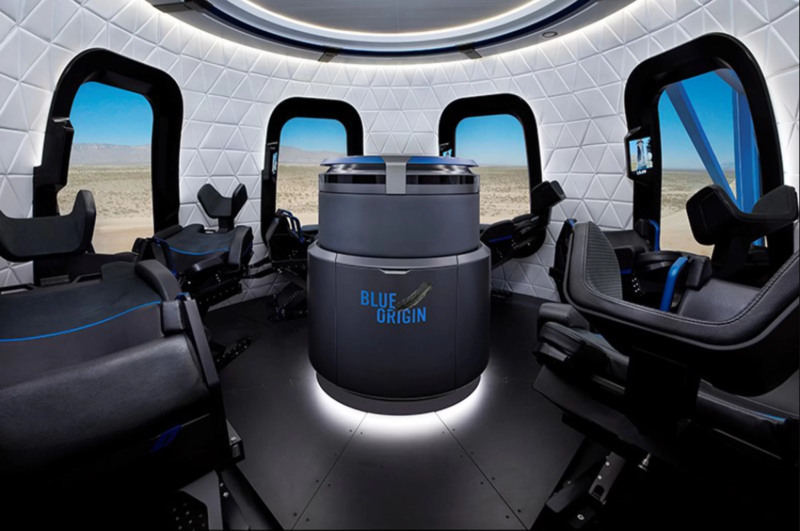 The “sneak peek” images from Blue Origin show the interior of the New Shepard, which boasts the “the largest windows ever in space” — as Blue Origin described them. The seats showcase a sleek black design embossed with the company’s feather logo. During take off, the seats are tilted back so its six passengers are facing up. 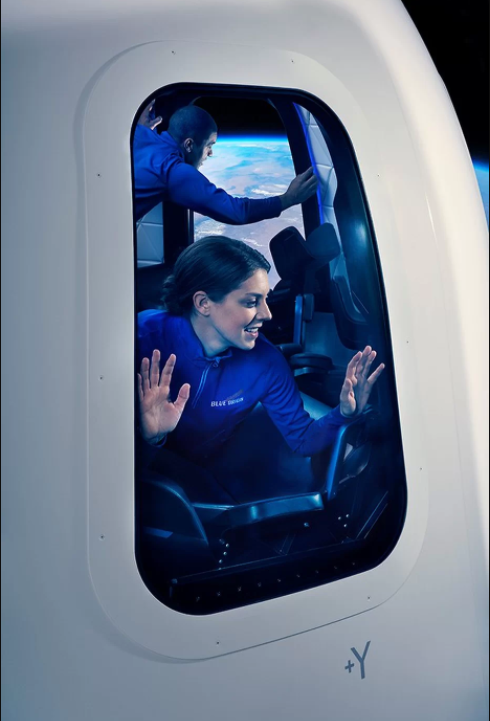 Once in space, passengers can experience weightlessness in the roomy cabin. While SpaceX and Blue Origin may be competing for who could launch the first fully reusable rocket, the goals of the two space companies differ slightly. For SpaceX, the ultimate goal is to bring humanity to Mars by the 2030s, with an immediate goal of sending two private individuals around the moon. Blue Origin, on the other hand, is developing their rockets for space tourism. In fact, the New Shepard isn’t meant for spaceflights beyond the Earth’s orbit. It is capable of suborbital flight that would bring it high enough to see space, but not high enough to completely loop around the Earth. The New Shepard also presents an opportunity for further microgravity research by serving as a laboratory in space, the company said. Bezos wants to offer higher altitude flights to space tourists eventually, using an orbital rocket now in production called New Glenn. Space tourism is an exciting new frontier, and Blue Origin isn’t the only company working toward it. Other companies include Virgin Galactic, which has been testing its own spaceplane VSS Unity for a glided space tour. Recently, the company has also started selling tickets for a trip aboard one of its spaceplanes. It has also received an FAA license for its SpaceShipTwo. Another company called World View is even using high-altitude balloons to bring tourists to space. For now, space tourism plans are limited to a trip around the world and the moon. But eventually — as NASA’s space tourism posters show — we may be able to book a ticket for a ride into the far reaches of space.